WHY DID SRI LANKA SEEK CHINESE INVESTMENTS IN PORTS? During the last decade, China has heavily invested in ports across the world spanning from Africa to Australia. In South Asia, they built the Gwadar port in Pakistan and the Hambantota Port in Sri Lanka. Despite being a staggering US$1.12 billion investment, last week’s tripartite agreement between Sri Lanka Ports Authority, China Merchant Port, and the Ministry of Ports and Shipping has left many criticizing China’s investments in the Hambantota port. In light of China’s potential long-term strategic goals, many view Chinese involvement in Sri Lanka with unease. However, it is often conveniently ignored that it is the successive governments of Sri Lanka that actively sought Chinese investments. Therefore, it is important to examine why we sought Chinese investments in the first place. China has been a forthcoming and non-interfering alternative to funding from international financial institutions and Western donors. They have the excess capital and the capacity to take high risks, and they financed the construction of the Hambantota Port at a time when no other country or development partner was willing to invest in it. Now a Chinese company has yet again come forward to further invest in the Hambantota Port to develop it rather than let it squander its immense potential while generations of Sri Lankans serve the debts on a non-performing port. From an International Relations point of view, China also serves as a counter balance against the regional hegemony of India and other influences on Sri Lanka. Therefore, rather than solely blaming China for their opportunistic investments, it is important to recognize that it is our governments that have voluntarily and actively sought these investments and exercised their (our) will when they reached out to China to fund a massive port project among other infrastructure projects. Since the turn of the century, China’s exponential growth and increasing influence in many regions spanning Australia, Africa, and South America have attracted the attention of the world. China has not spared South Asia in its unquenchable thirst for resources, search for strategic locations, and reach for emerging markets. According to the Heritage Foundation’s China Global Investment Tracker, from 2005 to 2014 China spent US$870.4 billion in worldwide investments and contracts, out of which US$8.9 billion was invested in Sri Lanka. 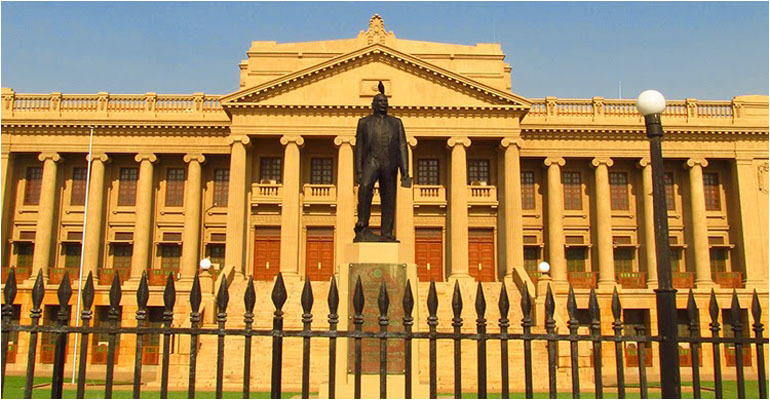 In contrast, according to the International Finance Corporation (IFC), which is part of the World Bank group has made cumulative investments worth US$596 million in Sri Lanka. Even though Chinese investments in Sri Lanka are a very small fraction compared to China’s global investments in regions such as Africa or South America, taken in context and compared to other global investors such as the IFC, these are considerable figures, and China’s investments in infrastructure are prominent. Chinese investments, grants, and trade are all intricately interlinked. In Sri Lanka, China is the biggest source of Foreign Direct Investment (FDI) pumping in more than US$400 million in 2014. China has been involved in a variety of projects such as the Norochcholai Coal Power Plant, Mattala International Airport, Katunayake Airport Expressway, Moragahakanda Irrigation Development Project, and the Southern Expressway, which is also the country’s first highway. China has also been the largest donor since 2009. China extended US$1.2 billion worth of assistance in the form of grants, loans, and credit amounting to 54% of the total US$2.2 billion committed by foreign countries and multilateral agencies. On the other hand, the Asian Development Bank invested only US$423 million and the World Bank US$241 million. China provided Sri Lanka US$5 billion in aid over the last decade. 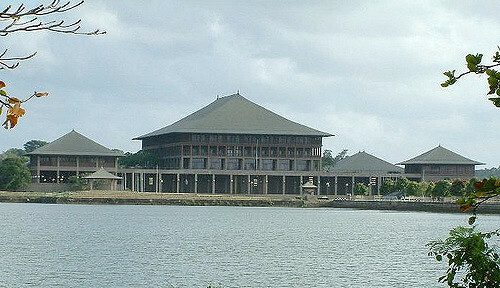 Some of China’s lavish gifts to Sri Lanka include prominent landmarks such as the BMICH, the Superior Law Courts complex, and the Lotus Pond (Nelum Pokuna) Performing Arts Theatre among others. China also fulfilled 65% of its total pledged assistance to Sri Lanka. China is not only a key investor and donor, but also a significant trading partner. It surpassed the United States as Sri Lanka’s second-largest trading partner behind India in 2013. In the same year, Sri Lanka’s bilateral trade with China exceeded US$3 billion. All these growing aid packages, trade relations, and investments indicate China’s increasing involvement in Sri Lanka and its lasting footprint in the region. Foreign policy analysts have explained China’s expansion in South Asia in the new millennium with diverse arguments. The most well-known among them, especially with regard to port construction is the theory of “string of pearls” which examines the intention of China in building commercial and potential naval bases along the Indian Ocean region, including countries encircling India. Earlier this year, China turned the string of pearls theory propounded by the west on its head with the launch of One Belt One Road (OBOR) initiative. With OBOR, China is expected to play a global leadership role in building infrastructure connecting China, Asia, Europe, and Africa through ports, highways, railroads, pipelines, power, fibre and other networks. Sri Lanka has enjoyed strong bilateral ties with China for decades. There are a number of reasons for Sri Lanka to prefer China to Western countries and multilateral organisations such as the International Monetary Fund (IMF), the International Development Agency (IDA), the World Bank, and the Asian Development Bank (ADB) to obtain funds. Unlike multilateral institutions, which impose numerous conditionalities based on human rights, democracy, and good governance, when extending development loans, China does not interfere in the internal workings of loan/investment recipient countries. Many countries perceive the conditionalities imposed by international organizations as undermining their sovereignty. According to former Sri Lankan Foreign Secretary Palitha Kohona, the Chinese government believes that low-key communication and mutually beneficial dialogue, carried out on an equal footing is more efficient than the US approach of distributing money and exerting pressure. Further, Western countries distanced themselves from Sri Lanka post 2009 based on war crimes allegations. During the nine-year tenure of President Rajapaksa, Sri Lanka moved away from its traditional funding partners such as the ADB, IMF, the World Bank and western countries, and inched closer to China. Though the present government initially seemed to distance itself from China in 2015, soon it realized that the West does not have the kind of resources that China has to support Sri Lanka, and that China’s tentacles in Sri Lanka are too deep. Besides, in the new world order, China is too big a player to take for granted anyway. Unlike Western donors who have been reluctant to invest in these high-risk, large-scale infrastructure projects, China is ‘forthcoming’ with their development support and investments. India has long seen itself as the natural leader in the Indian Ocean region and wants to ensure that its namesake ocean remains India’s Ocean. However, many countries both within and outside the region consider that the Indian Ocean is not only India’s backyard but also a region to which both littoral states and outside powers have a claim. With increasingly strong ties with the US and aims to curb China’s expansion in the region, India threatens to become an ever-greater hegemon in the region. While the US is strengthening ties with India, countries such as Pakistan and Sri Lanka are strengthening their ties with China as a way to counterbalance the regional hegemony of India. A closer look at Asia reveals that one of the biggest fears for many countries in the region is strategic encirclement. India fears encirclement by China, while China fears encirclement by the US based on the close relations that US has with Japan, Taiwan, South Korea, and also its military presence in Afghanistan. When countries in South Asia reach out to China to fund their infrastructure projects, they are also driven by the fact that closer ties with China will be a way to balance power with India. China has also been a formidable friend by supporting Sri Lanka in diverse international fora. For example, in 2012, China was strongly against the United States backed UN Human Rights Council Resolution against Sri Lanka. Supporting Sri Lanka against the UNHRC resolution, the former Chinese Foreign Ministry spokesperson Hong Lei stated that China opposes “using a country-specific human rights resolution to impose pressure” and China believes that the Sri Lankan government and people are capable of handling their own affairs. Though not openly admitted, Sri Lanka’s closer ties with China is also a balancing act to prevent the influence or interference from India, USA and other global players. Chinese investments are also justified as a way to achieve long-term development goals in terms of infrastructure development, employment generation, and trade expansion. The former government claimed that one of its main targets at the end of the war was to catch up on thirty years of lost development opportunities. China with its multi-million-dollar investments to put in place much-needed infrastructure became a dependable friend. Considering that Sri Lanka is located at a strategically significant point along the Indian Ocean, Hambantota aims to be a hub port between Singapore and Dubai. When the Hambantota port project was proposed, the Sri Lankan government claimed it would bring in prosperity to one of the least developed regions of the country and create job opportunities and boost the local and regional economy. The increased economic activity is expected to boost economic development and contribute towards improving regional transport linkages. Last week’s agreement for Chinese investment in Hambantota is endorsed with expectations of skilled employment generation, regional and national economic development, stabilising the Sri Lankan rupee, and the reduction of national debt percentage. Further, better transport infrastructure will provide better access to regional markets, especially those of growing economies such as China and India. There are a number of strategic, political and economic reasons for China to be interested in the Indian Ocean region and South Asia in particular. Though a Chinese naval base in Sri Lanka is far-fetched, it is evident that China is interested in maintaining its presence in the Indian Ocean region because of its strategic, economic, and political importance. Sri Lanka is key to gaining a strong foothold in the region and as a mid-point in the Indian Ocean where its vessels can refuel and crews can rest and recuperate. As the world’s leading manufacturing hub and the second largest economy, China also needs to secure energy and goods supply routes along the Indian Ocean. Therefore, it is only natural that China is interested in gaining a firm foothold on strategic locations along the Indian Ocean such as Hambantota and find alternatives to chokepoints such as the narrow Malacca strait. Further, these projects provide Chinese companies opportunities to engage in large-scale investments and earn revenue for decades. They also provide employment opportunities for Chinese labourers and for businesses to export Chinese machinery to be used in these projects. These investments also boost China’s soft power strategies by creating a presence and by being a catalyst for development. The growing economy of Sri Lanka provides a market, albeit small, for China’s manufactured goods. China is also strategically gathering supporters with these intricately linked economic, trade, and cultural relations. n 2014, China established the Asian Infrastructure Investment Bank (AIIB), a multilateral organization, which will fund infrastructure projects in Asia. It will enable Asian countries to improve their infrastructure while China can strengthen its economic and geopolitical leadership. China has taken a bold step by stepping outside of the established US-centric multilateral funding agency system and creating a China led-bank to fund diverse infrastructure projects in the region. The AIIB is also a strategy for China to legitimize its involvement in building infrastructure across the world and expand its reach beyond the periphery. Further, it is also a move away from the Washington based banks and Western norms to adopt a new set of norms and values based on China’s own experiences both as an investor and a developing country. It is based on all those interests that China is making large-scale investments in maritime infrastructure in Sri Lanka and other South Asian states, and China insists that their investments are only pacific and based on goodwill between long standing friends such as Sri Lanka. By nature, infrastructure developments are long-term projects that often take decades to actually reap their intended benefits. They often require further investment to develop facilities to make these projects profitable. Hambantota port was built as a transhipment and bunkering facility to refuel and provide supplies to the large number of ships that ply the main east-west shipping route. It still requires considerable investments to improve its services and facilities to make it a fully functional port. The proposed Industrial Zone in Hambantota is important because a port needs goods to export, and the Chinese investments in the Industrial Zone will help to generate that volume. To reach its potential and reap the intended benefits of this port, it is important to implement long-term plans for Hambantota and not abandon it. That is where continued Chinese investments in Hambantota port makes sense. The Sri Lankan government does not have the funds to develop it, no other global port operator is interested in developing it, and now there is a global Chinese port operator investing in it albeit for 99 years on terms largely favourable to them. For Sri Lanka, what better alternative is there? Speaking of China’s initial involvement in Hambantota, a senior Sri Lankan shipping professional says, “beggars are not choosers. We did not have the money or the expertise to develop a port. We had not built a port in the last 100 odd years… we could have bargained much better terms (with the Chinese investors) but at that particular time, we needed to see fast development.” No other country would be able to give some of the instruments that are required to build these infrastructure projects and the Chinese are very particular about timing and speed. That sums up yet another reason why Sri Lanka reached out to China for funding this port in the first place. While it is true that Sri Lanka did not have many options but to depend on Chinese loans and investments, there are also a number of factors such as non-interference, lack of conditionalities, China’s expertise and effectiveness in infrastructure development, and continued good relations that make China’s investments attractive. The high interest rates, strict commercial conditions, and the alleged lack of respect for laws or the environment are some of the numerous drawbacks of Chinese financing and moreover, the lack of transparency in agreements with China has led to many controversies and alleged corruption. Now, add to all of that a 99-year foothold for China in Sri Lanka, and there is also the question what will China want next? However, despite the common perception that China is opportunistically using Sri Lanka and many other countries as pawns in their great game in the Indian Ocean, it is in fact the Sri Lankan governments that have sought Chinese loans and investments. If our government plays its cards right, it is Sri Lanka that will eventually benefit from China’s investments. For that, it is important that the Sri Lankan government does what is needed to attract more FDI, develop an export economy, address issues of corruption and deliver on the promised good governance. Irrespective of whatever government is in power, it is also crucial to ensure that Sri Lanka does not become a playground for regional power struggles. Only time will tell whether that is too much to expect from our governments and its servants.